Well, my favorite time of the year is here, when I weekend in the Hamptons as most of us do, at the prelude to the busy summer social season. It’s all about getting away from city life and the media’s obsessive focus on the horror stories in the news and entering the bucolic peace and tranquility of the Hamptons—in between the parties, of course! It’s not all about fun and games—it’s also about what the French call noblesse oblige, being honorable and giving back. And Hamptonites do give generously and selflessly, and they do it with style and panache! With that said—drumroll, please!—here are some highlights from the best of the best of the whirlwind winter/spring social season that you’ll fi nd within the glossy, luxe pages of this Memorial Day issue of Hampton Sheet. It’s sure to excite the senses, especially as it includes my interview with heartthrob cover boy Robert Redford, whom I met at the premiere of The Company You Keep (p.30). Did you know that he really wanted to be an artist and paint in Europe, but that fate had other plans for him? He actually studied at the Pratt Institute (see Pratt’s Golden Gala on p.31). Now that I have your attention, check to see if your photo was snapped at any of the oh-so-glam galas, parties, and premieres chronicled here, including the Alzheimer’s Association’s Rita Hayworth Gala with Princess Yasmin Aga Khan, Candace Bushnell, Brooke Shields, and John McEnroe (p.4) ; the Breast Cancer Research Foundation’s Hot Pink Party, one of my favorite charity events of the year, hosted by Elizabeth Hurley with a performance by Sir Elton John (p.10) ; and mayoral hopeful John Catsimatidis’ over-thetop birthday bash for his wife, Margo (p.16). Take a peek at Mayor Bloomberg performing at the Inner Circle bash, where he sang and danced, off key and left-footed, of course, with the cast of four Broadway shows (p.19), and much more. Want to know how Beyoncé got her name? If you missed the item I reported to Page Six, turn to the story on the premiere of HBO’s Life Is but a Dream (p.23). On the same page, Jeffrey Lyons reviews a selection of fi lms, including HBO’s long-awaited Behind the Candelabra, starring Michael Douglas and Matt Damon. Still can’t get enough A-listers? The potpourri of society and entertainment within these oversize pages (no ink-smudged fi ngers here!) also include the likes of Donald Trump, Tony Bennett, Harry Belafonte, Paris and Nicky Hilton, Cyndi Lauper, Hugh Jackman, and Anne Hathaway… it’s all in the mix! And, dear readers, who’s not interested in the bottom line and property values, which are happily moving north again? 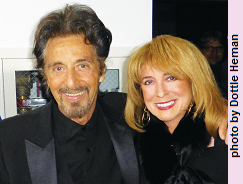 Don’t miss Douglas Elliman president and CEO Dottie Herman’s column, AskElliman (p.14)—and who knows better than Dottie? If you’re looking for a good summer read, aside from Hampton Sheet or Vogue, check out our Literary Lowdown (p.28). And for the latest on the performing arts, restaurants, clubs, and spas, turn to Jan’s Take (p.29). We’ve also made the summer soiree season easy for you with our take on the best of the best benefi ts. Just turn to The Sheet’s Hot Dates (p.32) and grab your highlighter. We’ll be out and about so say hi, and get ready for your closeup. Newsfl ash! I’ll be reporting again this season on the Best of the Best Hot Hamptons Happenings on 1010WINS on Thursdays and Fridays, on Joan Jedell’s Hampton Sheet Scoop. So stay tuned in and informed! And as the saying goes, “See you at the party” and around town at some of my favorite haunts, like Nammos, 75 Main, and Sant Ambroeus, just to name a few. It’s all in The Sheet! Joan Jedell appears on national and local TV. You can also catch her Hampton Sheet Scoop on 1010WINS. Her photographs are syndicated worldwide.